I have completed several independent, collaborative and logo murals around the city of Greenville, SC. Please contact me for more information and mural proposals, I love creating public art for everyone to enjoy! The Anchorage, located in the Village of West Greenville. The mural image is solely based on the logo I created for The Anchorage, was commissioned by Chef and Anchorage owner Greg McPhee, funded by Greenville's Art in Public Places grant and Community Journals, and completed in collaboration & execution with E. Kinney in 2016. "Every Day is a New Beginning" This mural is the fourth in the Stone Mural Project, in conjunction with Stone Academy's 5th grade class and PTA, and Furman University Art Department. Located at Hammack Law Firm, 223 W. Stone Ave, Greenville, SC. Completed in May, 2017. I created an three block print depicting the habitat and life cycle of the South Carolina state butterfly, the Eastern Tiger Swallowtail. 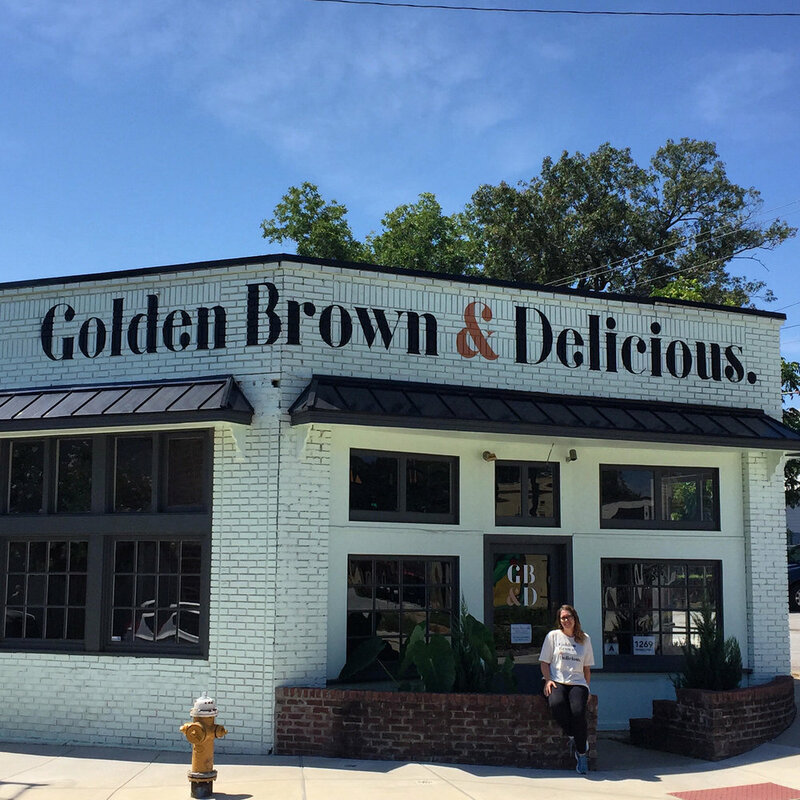 Hand painted logo on the exterior of Golden Brown & Delicious, in the Village of West Greenville. Logo design by Michael Asire. Completed in July 2017. Hand painted logo for Indigo Flow & Art, 1270 Pendleton St, Greenville, SC. Logo design by Rooted Brands. Completed in January, 2018. Hand Painted Mural for Heirloom - A Milltown Eatery, in Spartangburg, SC. Hand Painted Mural for Husk Greenville Located upstairs on the private dining room wall. Acrylic on Cedar. Hand Painted Signage for Carol’s Ice Cream Shop, Village of West Greenville. Hand Painted Signage for The Village Wrench, Village of West Greenville. Hand Painted Logo Murals for el Thrifty Social Club. Located along the Swamp Rabbit Trail, in soon to be Unity Park, Greenville SC.